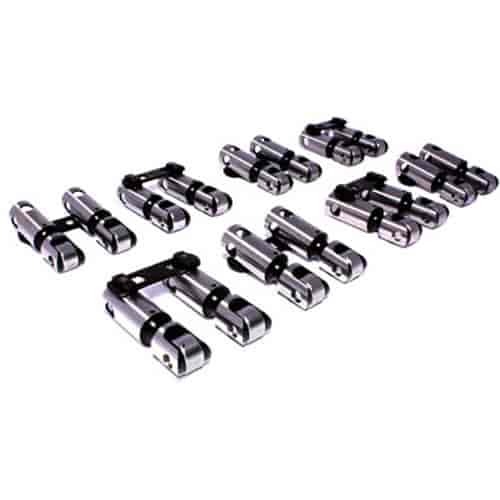 COMP Cams Endure-X Solid/Mechanical Roller Lifter Set Diameter:.875"
Perfect choice for applications without offsets, these Endure-X Solid Roller Lifters from COMP Cams are engineered to withstand the demands of aggressive cam lobe designs and increased RPM ranges. They feature a wear resistant tool steel axle, precision sorted needle bearings and EDM Oil Injection Technology that guarantees the bearing assembly receives a constant flow of oil. Endure-X Solid Roller Lifters are heat treated, machined to ultra-high tolerances and fully rebuildable. Patented link bar assembly combines the benefits of a removable link bar with the safety of a captured link bar. EDM Oil Injection Technology guarantees that the bearing assembly receives constant, pressurized oil flow via precision hole aimed at the bearings. Needle bearings are precision sorted by size to evenly distribute loads, which prevents premature wear and failure. Durable axle is made from wear resistant tool steel to prolong the life of the roller assembly, especially in high RPM applications.